The BJP had given Bihar's Nawada to the Lok Janshakti Party on Sunday, offering the Begusarai seat to Giriraj Singh instead. Chirag Paswan said his party postponed announcement of candidates due to Manohar Parrikar's death. 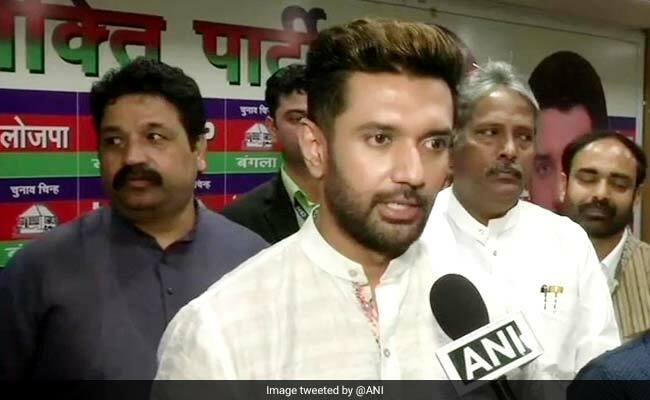 Hours after Union Minister Giriraj Singh protested against Nawada constituency being taken away from him as part of the BJP's seat-sharing agreement with allies in Bihar, Lok Janshakti Party (LJP) leader Chirag Paswan today said that his party will try to resolve any grievance caused by the political move. "We have good relations with Giriraj-ji. I got to know through the media that he is a little upset. I will call to ask if this is so, and if he is actually upset, I will try and resolve the issue," he said at a press conference here. However, Mr Paswan claimed that it was too late in the day to make any changes in the seat-sharing agreement. "I do not wish to cause Giriraj-ji any grief, but I think we have gone too far now to revisit the decision," he said. The BJP had given Bihar's Nawada to the LJP on Sunday, offering the Begusarai seat to Mr Singh instead. The Union Minister, however, seemed far from happy. "Why should I contest from Begusarai and not Araria?" news agency IANS quoted him as saying earlier today. Many saw this as an indication that Mr Singh may not contest from Begusarai. According to IANS, the Union Minister had even announced last week that he wouldn't mind sitting out the elections if Nawada was not allotted to him. The state BJP, however, downplayed his protests. "Giriraj Singh will abide by the party's decision... The LJP is likely to field Veena Devi, the sitting Munger parliamentarian, from Nawada," IANS quoted a party leader as saying on the condition of anonymity. The LJP will announce candidates for the six seats it will contest from Bihar by Wednesday. "We are saddened by the demise of former Defence Minister Manohar Parrikar. It is a big loss to politics. As the nation is mourning his death, we are not going to announce the names of our candidates today," the news agency quoted him as saying at the press conference. According to news agency PTI, he also said that while the ruling alliance has already divided seats among its partners amicably, the grand alliance of opposition parties is nowhere near doing so. "The so-called grand alliance has turned out to be an illusion," he said, asserting that the NDA will win over 350 seats in the 543-member Lok Sabha in the upcoming elections. Under the National Democratic Alliance's seat-sharing arrangement in Bihar, the BJP and the Janata Dal-United will contest 17 seats each while the LJP fields candidates from six. The state has 40 seats in the Lok Sabha.